Before we all head out to pour ourselves into weekend projects, how about a chat? 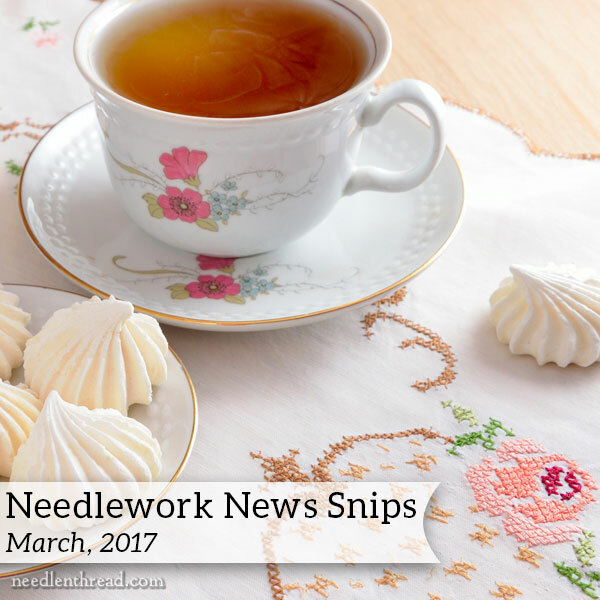 Today, I want to share with you some needlework-related snippets I’ve come across lately online – bits that I’ve found inspiring, instructive, or entertaining. I’ll also announce the winner of the slate frame give-away from last week. So pour yourself a cup, pull up a chair, and let’s browse together! I love to listen while I stitch. Whether I’m listening to music, an audiobook, the birds outside, the distant sounds of life in a rural town, or a conversation in the next room, while I’m stitching, my Listening System is always in tune to something! I’ve recently re-discovered the world of podcasts. Podcasts are audio presentations, usually focusing on interviews or specific interesting topics, that you can download (or stream) online. I’ve found that they’re great for short bursts of stitching. Most podcasts range from 20 minutes to about an hour long, making them a nice length for an embroidery session. And while I enjoy all kinds of podcasts, we’ll keep these textile related! I really enjoyed listening to this interview on Shopify with Jenny Hart, the owner of Sublime Stitching. She tells her story of how Sublime Stitching came to be, and the things she’s learned along the way. It’s informative and fun! For a wider range of fiber-related podcasts, where different designers in the needle arts and the fiber world are interviewed, take a browse through Fiber Talk, where you’ll find podcasts for the fiber art hobbyist. There’s a good list there, and definitely worth the browse! Another podcast on embroidery that you might enjoy is this one on How She Creates. I haven’t listened to it yet, but it’s next up on my listening list. So, if you’re looking for something to listen to while you stitch, search for podcasts on any particular subject that interests you. They’re often free, and they’re a great way to learn more about a subject you’re interested in. Online Needlework Classes – On Sale! This weekend, Craftsy has all their online classes on sale for under $20. This is Great News for those of you who have been itching to try a new technique this year! If you’re not into goldwork or stumpwork, though, you’ll also find a nice bead embroidery class, as well as this class on adding texture and dimension to embroidery, with wool appliqué and fun stitches. This is a terrific time to jump on some online classes! Once you have them, they’re yours, so you can go back to them any time. PS. I use an affiliate link for Craftsy, which means I get a tiny kickback to help keep Needle ‘n Thread going, whenever you purchase a class through my link. Thanks! While podcasts are frequently used for audio interviews, blog posts are still prime real estate for written interviews. Sharon Boggan on Pintangle has recently interviewed Maureen at CrazyQStitcher, and I found the interview fun and insightful. Maureen’s crazy quilting is lovely (I love her little birds! ), and the whole article makes great reading. You can find it here. I’m sorry I even said that! If you’re familiar with the “song” (I don’t know if you can actually call it music), you might curse me for introducing an ear worm. If you now have the song stuck in your head, I apologize wholeheartedly! If you’ve never heard it, trust me. Don’t look it up! Still, I love foxes in art! And this little needle painted fox embroidery kit by Helen Richman of The Bluebird Embroidery Company in the UK is absolutely adorable. If you’ve wanted to learn how to stitch a realistic little critter, this is a great place to start! There’s a step by step instructional booklet in the kit, plus ground fabric and backing fabric, thread, and needles. The fox is just around 3″ tall, so he’s pretty small! But he’s nicely detailed. I haven’t started working mine yet, but I’ve added this kit into my project mix, so I’ll tackle it one day soon. The only con about the kit is that I’ll probably have to touch up the design transfer. On the dark fabric, the very fine and intermittent line in kind of a copper color is difficult for me to see, so I’ll trace over it with a fine white pencil. Also, just so it’s not a surprise, in the kit I received, the fox is actually oriented facing to the right, not the left. If you’re in the US, you can order the kit here through The French Needle, where you can also find these other embroidery kits from Bluebird Embroidery Company. If you’ve been hanging around me for a while, you know I have a penchant for old needlework publications, and especially pattern and instructional booklets from ages past. Antique Pattern Library is absolutely the best source online for browsing and downloading old needlework publications. For those who haven’t enjoyed a good browse through APL lately, you might like to know that they’ve organized the site in many ways, and one of my favorites is that they have an embroidery category. To browse through specific needlework related topics, check out the categories right under the image on the home page of Antique Pattern Library. You’ll find topics like Hardanger, ribbon work, drawing, calligraphy, tulle embroidery, whitework…. Yep, you’ll get lost there. But hey – it’s a great way to spend a Saturday morning! If you’ve ever wondered what a needlework retreat (as in, the luxury vacation kind!) is like, you might enjoy reading Jillian Dellit’s blog. Jillian is blogging her adventures on the Crewel Work Company’s Lady Anne Arts and Crafts retreat, in the Lake District of England. For the curious – or if you’re like me, a Vicarious Traveller – it’s fun to read! *Sigh* Admittedly, it can instill a bit of wanderlust and more than just a little bit of an avid yearning to go! Finally, the lucky winner of last week’s slate frame give-away, who gets a gorgeous slate frame from Mythic Crafts all to herself! The randomly drawn winner is Irene Kennedy. I know you’ll love it, Irene! I’ll be sending you an email to request your mailing information. Next week, a follow up Stitch Fun! tutorial from the tutorial I posted this past week. Yes, I’ve been dabbling! I’ll share with you a Most Fantastic gift that I received from a reader (thank you, Pat! ), and we’ll talk about old patterns and what to do with them. And we’ll have a chat about a touchy subject called Time. And progress. Oh yes, I’ll be sharing some progress with you at some point, as I’ve been plowing through a few things. I have purchased the stumpwork class from Craftsy. Just a warning that there are a few errors and omissions. If you buy the class read the student comments. The replies will reflect most of the required corrections. Congratulations to Irene I hope you really enjoy the frame it looks wonderful. The fox is so lovely even though like you I reservations about them, not my favourite animal. I will have to go through and look at all the podcasts never thought to use them before to listen to. I can’t wait to see your gift from a reader how nice and generous of her. Looking forward to next week posts. Thanks for all the snipits you have shared with us this Saturday very interesting. I hope that your health bearing up. I love your newsletters and the wealth of information you give us. I did a stumpwork Summer School with Helen Richman last year with my region of the Embroiderers’ Guild, UK – thoroughly delightful and enjoyable! Helen told us that she was working on a book and yesterday I had advanced notification from Amazon of its publication on June 26 in the UK, you might like to keep an eye open for it. Omg…now you,ve done it! Love your newsletter as usual. I am 61 and I’ve never done an embroidery project. I am very inspired by you. Keep up the good work. Hi, Lesa! Welcome aboard to the Wonderful World of Embroidery! I hope you have a chance to undertake a project one of these days. It’s quite an addicting hobby! Thanks for all the interestibg links! I am grandmother of 16, and a a wool spindle spinner, knitter, and a hand piece quilts tops, and hand- quilt. But I have returned to embroidery. I need small and practical gifts to give to my newly wed grandchildren. I am having a hard time finding books, and patterns. I am embroidering tea towels, soon I will be making and embroidering pillowcases, and I may even spin my own yarn for some crewel. I am excited about your site. Previous Previous post: Colour Confident Stitching – A Gem!